Trailhead is located on Shaker Rd. in Concord NH (summit is in Loudon). Shaker Road leaves Rt. 132 0.4 miles north of Rt. 93 at Exit 16. The parking area 2.4 miles up the road, on the right side. Oak Hill is a small hill with a fire tower. It is located on a preserve with many other trails to explore. The trail system provides a pleasant forest walk through an easy-to-navigate network. There are two fine viewpoints from along the trails. From the parking area, follow the gradually-climbing Tower Trail for about 0.2 miles, bear left as Lower Trail goes right, then quickly turn right onto Ledges Pass. Cross Upper Trail in 0.2 miles, then continue 0.1 miles and turn left onto Vista Way. Pass Win's Way in another 0.1 miles and arrive at the first viewpoint. This view is from a low elevation, showing the surrounding area and Mt. Kearsage. Return the way you came all the way back to Upper Trail. Turn right onto this trail and proceed 0.3 miles, pass Murray Bluff (trail) on the right, and continue 0.1 miles to Tower Trail. Bear right to join Tower Trail and go 0.3 miles across a plateau, then turn left onto Dancing Bear Trail. Pass a bench and continue 0.4 miles to the second viewpoint, known as 'Swope Slope Vista'. From boulders and a clearing, there is a nice view of Mt. Kearsarge, Mt. Cardigan, and Ragged Mountain. Continue on Dancing Bear Trail, passing Krupa Loop on the right, and go 0.2 miles, then bear left to rejoin Tower Trail. Continue 0.4 miles as the trail gradually swings to the right and descends to the Concord/Loudon town line, where it meets Ron's Way. Turn left to stay on Tower Trail and ascend the final 0.3 miles through a cleared area to the summit. 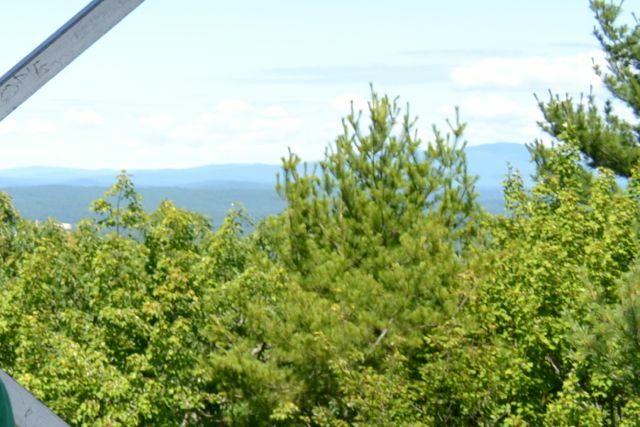 The summit fire tower provides a limited view over the treetops in several directions. You can return the way you came while avoiding the loops to the viewpoints by simply staying on Tower Trail, which leads back to the parking area in about two miles.